This CD contains reproducible versions of the MathWorks 12 Workbook in PDF, Flipbook, and Notebook formats for teachers to print and/or display to support course instruction. 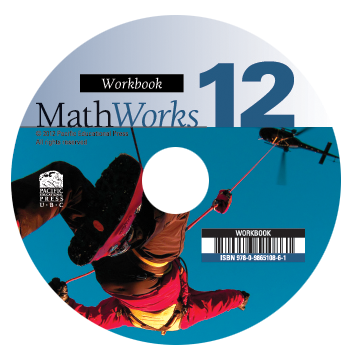 The MathWorks 12 Workbook emphasizes mathematical skill-building through worked examples, practice problems, and differentiated learning strategies. The content mirrors the MathWorks 12 Student Resource. Errata: The original printing of MathWorks 12 Workbook contained the errors found in this document (PDF). We apologize for any inconvenience this may have caused. These errors will be corrected in future printings of the resources.